My son started a new school this year. It is a charter school that has no electronics or technology. No televisions, no computers, no tablets, no ipads on which to complete homework. Until the 10th grade. NONE. They couldn’t even watch the solar eclipse in their classes this week, because there was nothing on which to watch it. A school completely devoid of electronic devices. In this age of internet connectedness, with kids as young as two staring at phones and tablets to keep them quiet, this may seem like a step backwards. But, in my opinion, what it really is instead is protection, proactivity, and the prolonging of unnecessary awareness of things that kids should not see or know. For me, especially as the person on the front lines witnessing the fallout from screen addictions and the negative impact that social media has on kids, it is a welcome relief. I have previously written an article about the very real dangers of screens and the influence and impact that they have on kids. More and more research is showing that kids are actually changing the chemical and neural composition of the brain when they are staring at screens. Teenagers are less likely to have difficulties with screen time, yet more and more elementary school kids are being assigned laptops and tablets for academic purposes. It really is a dangerous path, especially when the mental and cognitive health of kids is on the line. Social media has become such a staple in our lives that it is difficult to remember what we did before everyone’s lives were on display for the world to see. Interestingly, this generation of kids believes that this is the way it has always been. Without going into all of the inherent issues with false lives portrayed, kids are feeling more and more pressure to post the perfect picture, video, image, and conversation. The kids that are coming to see me are largely obsessed and consumed with online personas. And this creates more peer influence, peer pressure, and peer competition than ever before. The result has been disastrous for mental and emotional health – I see it everyday. Although many apps are in fact part of social media, there are quite a few that fall into the “messaging apps” category, complicating the process of managing kids’ exposure even more. 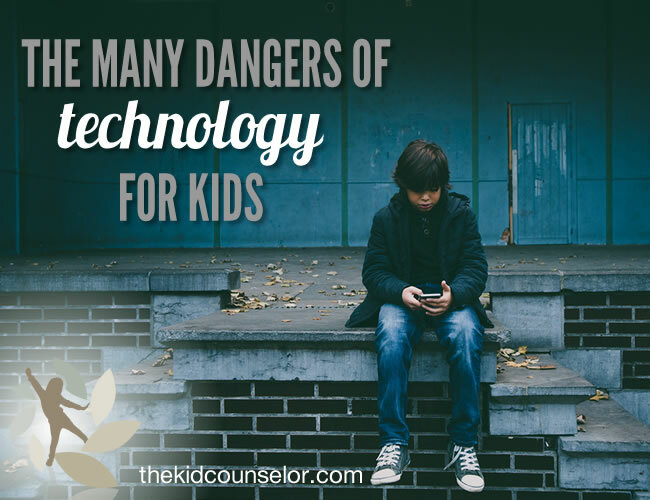 Facebook and Twitter have long served as the way to show the world what you choose, but kids have begun to gravitate toward messaging apps which allow them to communicate with a specific person or group. Instagram, Snapchat, and Messenger are providing kids with captive and engaged audiences that can be highly influential on attitudes, behaviors, beliefs, and perspectives – for better or worse. As a whole, I do not believe that technology is bad, nor that kids should have no access to the online world. However, research is certainly proving that it is a slippery slope for kids. And if parents aren’t very purposeful, careful, and intentional about limiting how much and what kids see on a screen, it can be very damaging to their well-being. Stop Asking Your Kids Questions!